In her essay "Almandal Grimoire: The Book as Magical Object," Genese Grill writes, "A body, more than any other physical object except maybe a book, is a powerful portal to the spirit." The treatise by the local artist, writer and educator is hand-bound with a letterpress cover. It is tucked among other handmade books on view at "BOOKBODY," the current exhibition at Burlington's New City Galerie. Grill's words should be emblazoned on the wall, as they perfectly capture the show's thesis, and the essay is a gem that many gallerygoers are likely to miss. The juried show features 13 artists selected from approximately 20 submissions. Works were chosen by New City Galerie artist-in-resident and assistant curator Susan Smereka, comic artist and illustrator Glynnis Fawkes, and Ben Aleshire of Honeybee Press. The concept of "BOOKBODY" arose from the fruits of Smereka's labor while in residence at New City from May to October. "[The book] is an interesting form on multiple levels," she tells Seven Days. Smereka claims that she's "anxious to push the boundaries of the book," and that it's the "nuts-and-bolts way of looking at a book" that really interests her. She's particularly fascinated by the correlation between the book body and the human body: Both have spines and faces, for example. At its heart, "BOOKBODY" is a show about text — what it is, how we record it, how accurately it can capture the truth of a person or experience, and how powerful it can become. The only work that references a specific volume is an oversize carved and painted wooden Bible by Memphis-based artist Edwin Jeffery Jr. Titled for Jeffery's chosen cover illustration, "Daniel in the Lion's Den" is an invented Bible fashioned from a single solid piece of wood — a symbol of a book. In the same vein of book-as-sculpture are two textless works by Burlington artist Gregg Blasdel. One of these is "Graphite sewn book," which he made in 1980. It is a sealed volume, its pages stitched tightly together and saturated to complete blackness with India ink. Physically bound as the book is, the effect is violent and exclusionary. Though it's unclear whether the tome is the perpetrator of the violence or the perpetrated, it has been granted a body through a challenge to what we understand a book to be — a collection of visible, turnable pages. The most traditional books on view are artist books by Nina Dubois, Steve Kostell, Donna Stepien and Smereka. Visitors are invited to flip through them, so long as they don white gloves. "The Little Biscuit" is Dubois' riot grrrl-inspired journal featuring a handwritten introduction that pays homage to punk musician and activist Kathleen Hanna and the feminist 'zine movement she helped fuel in the early '90s. Only about half the pages in Dubois' notebook are filled with collages and cutout poetry — it's a work in progress. Altogether, it seems more artifact than art; however, its inclusion is a thoughtful nod to the political potential of the handmade book — self-published, self-distributed material as a critical tool of self-expression. 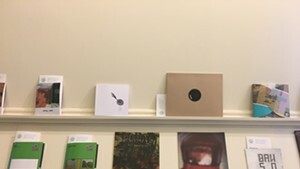 Kostell's books — "self-reflective" and "hot+cold" (a set); and "movement through arcana" — portray bodies-in-arrested-motion through digitally altered photographs and film stills. Craft is important to both books, with their nontraditional bindings: "self-reflective" and "hot+cold" can be viewed as books but also unfold into posters, while "movement through arcana" has a "piano hinge" interlocking binding that gives it a distinctly mechanical look. 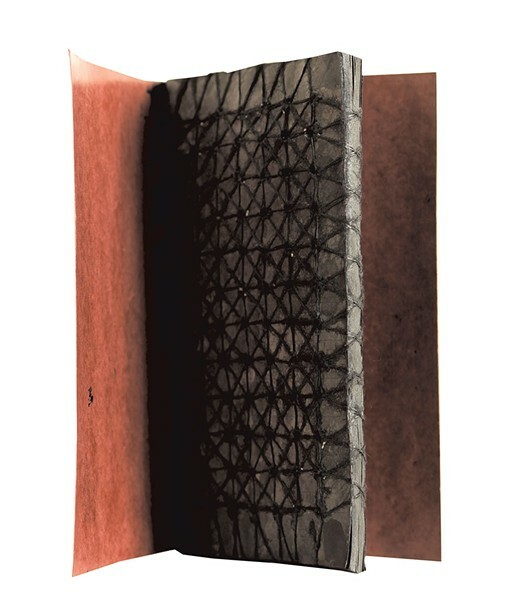 Stepien's "Widzi mi si / It seems to me" is a handmade book with a stitched binding. Instead of cutting the threads, Stepien left long ones attached and trailing behind the book, directly evoking the connection between the book arts and textile art. Works from Nina Gaby, Josh Oliver Turk and Noah Riskin are more experimental riffs on the structure of books and text. Gaby's "When I Was Japanese: 500 Bowls, Guilt vs Shame, Imperfection, Mottaini" is tableau-as-scrapbook, an arrangement of four porcelain vases so delicate as to look like paper. Each contains rolled documents with words in English and Japanese. Turk's "body" is similar in its agglomeration of unbound "documents," which include an empty pack of Marlboro menthols. His is the only work that directly addresses the transition from print format to digital, an excerpt from his lengthy prose asking, "and really how different is a cell phone from a body?" Enlisting simple science to enchanting effect, Riskin's installation, "Evolutionary Exuberance," reflects a poem onto the ceiling with a projector and a hanging plane of water. 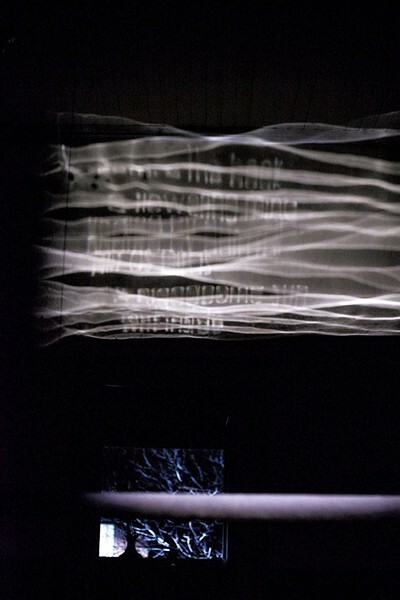 Visitors are invited to shake the plane, which is suspended by wires, casting ripples on the projected image and altering the appearance and visibility of the text. Smereka says that before starting her residency she knew that she would be working with video installation and that she wanted to make a book with multiple copies. In September, Smereka's older brother Peter committed suicide. The sudden loss infuses both of her works on view, the book "not not still" and the video installation "Not Not Bubbly Flow." The perfect-bound softcover book "not not still" is dedicated to Smereka's brother. Copies are available for sale, lined up beneath the originals of the pen-and-ink drawings inside the volume. These, most of which Smereka says she did in 2008, use fine lines to create silhouettes of a human head. The most poignant image is also the simplest: a head in profile split in two, with a crack of white where no lines connect. While the drawings are not inherently dark, they take on weight in the context of the book, which narrates a "countdown to forever" and features an aggregation of single words, including "unseen," "darkness," "hesitant" and "alone." Smereka's "Not Not Bubbly Flow" is decidedly at the "body" end of the "BOOKBODY" spectrum. Born from her preoccupation with loops of all kinds, the installation features large, sculptural forms hanging from the ceiling. These are made from white clothes that belonged to a friend of Smereka's who died last year. 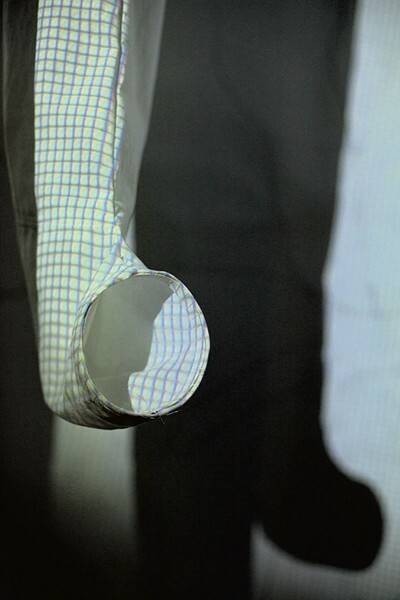 Shaped like especially curvy windsocks, the soft structures taper to thin, cuff-like openings. Smereka explains that her original intention was to attach the openings to create whole loops, but she decided at the last minute to leave the structures as they were. Projected onto the severed loops are video of shadows and wind turbines, which Smereka likens to a book's rapidly flipping pages. The artist says she wanted the "video image to become something else based on what it's projected on." Installed in a gallery corner, the backdrops to these nontraditional "screens" are drawings from Smereka's brother's notebook. She describes Peter as a mathematician and says that, after his death, she found the similarities between her work and his to be uncanny. "His mind was extremely creative," she says. Before he died, Smereka was already "grappling with the idea that death was a part of this"; afterward, she says, she "put both feet in," incorporating her brother's work into her own. The relationship between materiality and loss is central to "BOOKBODY." The show is anything but narrow, provoking questions about the use of text to preserve information and enhance memory; it also asks how bodies can be viewed as texts. Ultimately, the chosen works suggest that books and bodies face the same conundrum: Both are communicative vessels made from fragile materials. The original print version of this article was headlined "Page Counts"